Formulated to display the natural benefits derived from the combination of selected plant extracts including seem, citronella, tea tree & cedar wood, to collectively maximize their traditionally known insect repelling and skin care properties in a mild shampoo base hair-coat conditioners. Direction for use: Wet pets coat thoroughly. Apply liberal amount of Machiko Flea Shampoo on different parts of body. Rub thoroughly into depth of hair coat until covered with rich lather. Leave for 5-10 minutes before complete rinse-off with water. Repeat as necessary. 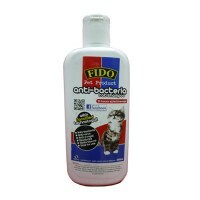 Regular usage of this shampoo on weekly or such appropriate intermittent periods together with good cat-house hygiene will help contribute to a controlled situation free from fleas, lice, mites and ticks. A formulated cleansing shampoo containing 0.5% chloroxylenol and 0.2% salycydic acid used an aid for the prevention and control of dermatological (skin) conditions commonly caused by fungi, yeast and bacteria. It is complemented with anti-itch moisturizers from natural oatmeal and deodorizing agents to help neutralize offensive odors on cats. Recommended for regular use on cats with long or short coats. Direction for use: Wet coat completely with water. Apply and lather shampoo all over the entire body. Allowing 3 to 5 minutes before rinsing of completely with water. Avoid contact with eyes in the course of shampooing. Otherwise flush off with water. Repeat process if necessary.